XcodeHelperCli keeps you in Xcode and off the command line. It's built from XcodeHelperKit. Tar and upload your binary to AWS S3 buckets. Combining all these features gives Xcode and Xcode Server the ability to handle the continuous integration and delivery for both macOS and Linux (via Docker) so that we don't have to use an intermediary build server like Jenkins. 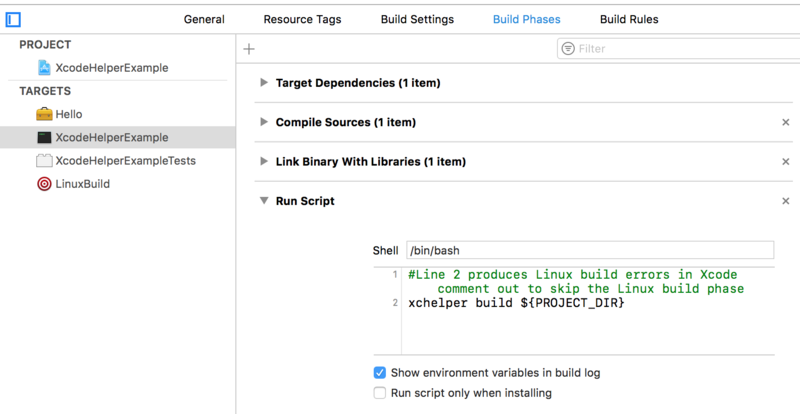 Build a Swift package in Linux and have the build errors appear in Xcode. Building and testing your Swift code in Xcode on the macOS is one thing. But, then you have to fire up Docker and make sure that there aren't any library differences or unimplemented language features on the Linux side of things. It's kind of a pain. 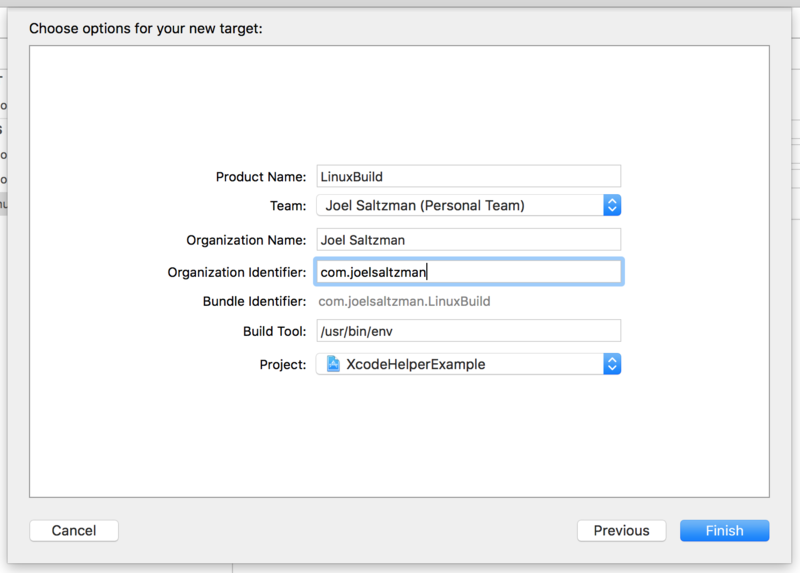 XcodeHelper eases these pains with the Linux side of cross-platform Swift development. 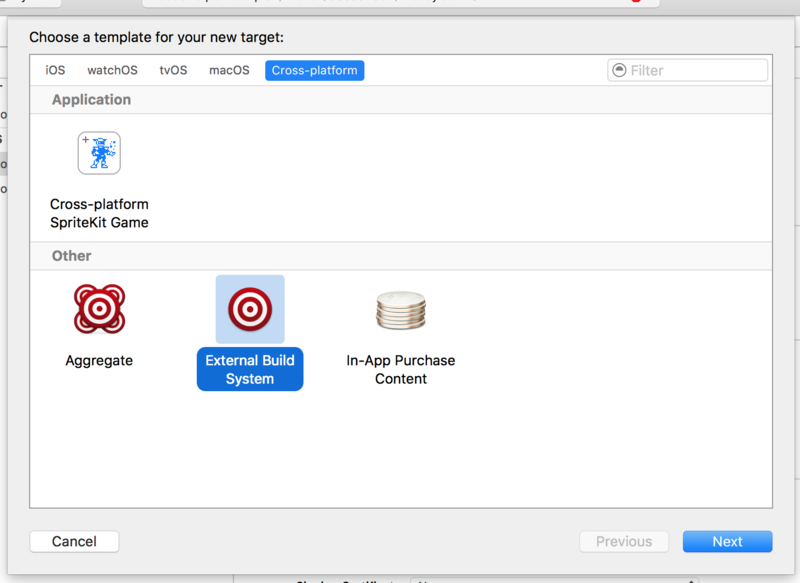 Create a new External Build target in Xcode. -i, --image-name or env var UPDATE_PACKAGES_DOCKER_IMAGE_NAME| The Docker image name to run the commands in. Defaults to saltzmanjoelh/swiftubuntu. Option | Description ------------- | ------------- symlink-dependencies, or env var SYMLINK_DEPENDENCIES | Create symbolic links to your dependencies and it will update your Xcode Project to use those symlinks instead of the directories with version number suffixes. Option | Description ------------- | ------------- create-archive, or env var CREATE_ARCHIVE | Archive files with tar. ARCHIVE_PATH the full path and filename for the archive to be created. FILES is a space separated list of full paths to the files you want to archive. -f, --flat-list, or env var CREATE_ARCHIVE_FLAT_LIST | Put all the files in a flat list instead of maintaining directory structure. Defaults to: true. The upload-archive command will download any updates to your dependencies via swift package update SOURCE_CODE_PATH is the root of your package to call swift package update in. There is an example project available to see the full configuration. ##Keep your "Dependencies" group in Xcode referencing the correct paths When you need to update your package dependencies, you have to call swift package update. This breaks your project and now you have to call swift package generate-xcodeproj again or update your references in your project. Use update-packages and symlink-dependencies to help with this process. Here is an example of updating your packages, creating/updating your symlinks to those packages and having Xcode updated to use those symlinks. Please note the use of xcrun. You can use this if you get any errors like cannot load underlying module for 'Darwin' or did you forget to set an SDK using -sdk or SDKROOT? ##Tar and upload your binary to AWS S3 buckets. Use create-archive and upload-archive to help get your files to an S3 bucket. You might use this if you are using CodeDeploy or something similar to monitor an S3 bucket for continuous integration.